Like so many other towns in East Texas, Bryan was born from the Houston and Texas Central Railroad. In 1859, when the railroad company planned to build a line through the Brazos Valley area, William Joel Bryan donated land for a town site. Growth was slow at first as the railroad stopped 20 miles south in Millican, and construction was suspended during the Civil War. Finally, in 1867, the railroad reached Bryan, which soon after became a regional cotton shipping center and the seat of Brazos County. Perhaps the first Jews to settle in Bryan were the Sanger Brothers, who followed the Houston and Texas Central Railroad northward, opening stores in each town the line reached. The Sanger Brothers opened their Bryan store, run by Lehman Sanger, in 1867. That same year, Bryan suffered an outbreak of yellow fever, costing the lives of two young Sanger brothers: Jacob, age 22, and David, age 16. Despite this tragedy, Lehman remained in town with his family operating the store even after the railroad moved north and Bryan was no longer its terminus. In 1874, the Sanger brothers decided to consolidate their retail empire and closed the Bryan store. Other Jewish immigrants were drawn by Bryan’s economic opportunities once the railroad reached the town. Both Prussian-born Myer Levy and Isaac Cahn, an immigrant from Bavaria, owned dry goods stores in Bryan by 1870. The following year Isaac Mandelbaum opened a retail store in town. By 1872, other Jewish-owned stores in Bryan included: H. Cohn, a grocery store. Horatzky & Eichenbaum, a dry goods and clothing business, and Sam Kaiser & Co., a dry goods store. According to a report in the American Israelite newspaper, eight Jewish families and a handful of single Jewish men lived in Bryan in 1873. The Bryan Jewish community developed quickly after the coming of the railroad. In 1870, Bryan Jews founded the Hebrew Benevolent Society, and soon after acquired a plot of land from the city to use as a cemetery. The society’s founders included Lehman Sanger, Isaac Cahn, D. Wolf, Frank Moore, M. Levine, and M. Mayman. The group was quite active in its early years. In 1872, they held a grand Purim Ball. The following year they raised money to help yellow fever victims in Shreveport, Louisiana. The Hebrew Benevolent Society bought land in 1870 with hopes of building a synagogue on it. The group’s progress soon stalled, and the lot remained vacant. In 1887 it was sold at auction for non-payment of taxes. Although the group was eventually able to reacquire the land, they later sold it to a Baptist congregation who quickly built a church on it. Bryan Jews never formally established a congregation or hired a rabbi during this period, though they did hold informal services for the major holidays. They would bring in rabbis from Waco, Houston, or Hempstead to perform weddings and funerals. By the early 1890s, Bryan Jews were not holding regular religious services. In 1892, the local newspaper noted that many Bryan Jews were in neighboring towns and cities for the Rosh Hashanah holiday. By 1894, they began to hold services for the High Holidays, which were led by a Mr. Spielman from New York. In 1897, they tried to bring in Rabbi Bloom from Waco for Rosh Hashanah, but he was prevented from coming to Bryan by a yellow fever quarantine. Rabbi Bloom did lead Yom Kippur services that year. For the next dozen years, Bryan Jews would usually hold High Holiday services, sometimes in private homes and other times at the Knights of Pythias Hall. Often these services were lay-led, though sometimes a visiting rabbi would come to Bryan to lead them. Jews from such nearby towns as Hearne would travel to Bryan to worship on the High Holidays. There is no indication that the group met for weekly Sabbath services. In fact, in 1908, Rosh Hashanah services were canceled because they could not attract a minyan of ten men. Nevertheless, most of Bryan’s Jewish merchants closed their stores on the holiday. As late as 1911, some Bryan Jews would go to Houston for the High Holidays. By the turn of the 20th century, Bryan was undoubtedly a small Jewish community. According to one estimate, only about 16 Jewish families lived in Bryan in the years between 1903 and 1905. Bryan Jews were linked to Jews in other Texas towns through ties of kinship, friendship, and business. The Bryan Eagle newspaper detailed the many trips local Jews took to visit friends and family around the state. During the late 19th and early 20th centuries, there was a lot turnover in the local Jewish community. People would move to Bryan and open a business, and often sell it within a few years and move elsewhere. This instability in the Jewish community certainly played a role in their inability to establish a permanent congregation or build a synagogue. Despite this turnover, a handful of Jews managed to establish lasting businesses in Bryan. Sam Levy left Germany in 1879 and settled in Bryan a few years later, opening a furniture store with his younger brother Julius in 1883. The Levy Brothers furniture store remained in business until 1920, when Sam moved to Houston. In 1880, Gabriel Schwarz, who earlier helped to found the Hempstead Jewish community, moved to Bryan and opened a fancy grocery store and oyster parlor in 1880. Even though Gabriel’s brother Chayim was an Orthodox rabbi in nearby Hempstead, Schwarz had no problem selling the non-kosher bivalves. In 1886, his son-in-law, A. Emden, joined the business, which became known as G. Schwarz & Company. The restaurant and grocery remained in business until 1898. Several Jews were involved in the liquor business in Bryan in the late 19th century. By 1890, Heyman Rypinski was a liquor dealer in town. Joe Groginsky left Poland and moved to Bryan by the 1880s. He owned a number of different businesses over the years, but perhaps the best known was his saloon, The Royal Bar, which was known informally as the “Third National Bank of Bryan” because of all the money that passed through it. In 1909, Groginsky began to host the possum dinner, a longtime local tradition. In addition to the marsupial, Groginsky also served oysters and barbecued pork to his patrons during the event. After prohibition was instituted, Groginsky opened a dry goods business in Bryan, telling the local newspaper that his new venture attracted “a higher class of people” than his saloon. Groginsky later owned a shoe store. Jacob Schwarz also owned a saloon in Bryan in the 1890s. In 1893, Schwarz ran afoul of the law for selling liquor without a posted permit, and was fined the staggering sum of $1200. After a strong petition by the county judge, commissioners, and other local officials, Texas Governor James Hogg agreed to reduce the fine to $50. This extraordinary intervention by local officials on Schwarz’s behalf suggests that Jews in Bryan were well integrated within the economic and political power structure. Indeed, John Mike, a local Jew who owned a dry goods and grocery store, served as a city alderman in the 1880s. Marx Goldstein was very involved in local Democratic politics, and was elected alderman in 1883. In 1912, Sam Levy ran for alderman with the endorsement of the local newspaper the Bryan Eagle, which noted that he ran one of the city’s most successful businesses. The paper editorialized that due to Levy’s business success, “it is a reasonable conclusion that he will make a success of the city’s business.” Levy won the election and ultimately served four years on Bryan’s board of aldermen. Bryan Jews also predominated in the local theater business. In 1890, Jacob Schwarz and his brother-in-law Heyman Rypinski leased the space about city hall, turning it into the Grand Opera House. Five years later, Schwarz expanded his theatrical business by leasing the Opera House in Waco. John Mike took over as manager of Bryan’s Grand Opera House after Schwarz moved to Waco. Schwarz also got involved in the creative side of the business, writing and directing a comedic minstrel show in 1893 and forming a 12-person comedy troupe that toured across the state. In 1926, Morris Schulman, who had been in the theater business in Houston, moved to Bryan and bought the Palace Theater. Schulman converted it to show motion pictures in addition to hosting vaudeville shows. Only a few months after moving to town, the Bryan Eagle called Schulman “Bryan’s theatrical giant.” Schulman was very charitable, holding numerous benefit events at the theater during the Great Depression to aid local food banks. He held an annual Christmas party at the theater in which admission was a donated toy that was given to needy families. Tragically, Morris killed himself backstage at the Palace in 1935. His wife Edna took over the reins of the Bryan Amusement Company. 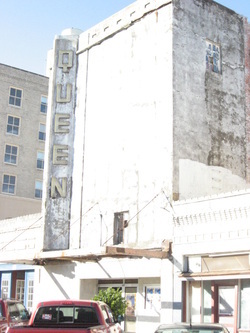 In 1938, she purchased the Art Deco style Queen Theater, just across the street from the Palace. Her son Bill Schulman later took over the family business, which at one time controlled all of the movie theaters in Bryan. As new multiplex movie theaters were built in the suburban parts of the city, the Queen and the Palace deteriorated and eventually closed. In 1986, the roof of the empty Palace Theater collapsed. The Schulman family donated the remains to the city, who turned it into an outdoor theater. The Queen Theater remains closed but standing in downtown Bryan today, waiting for the area’s renaissance to revive its faded glory. After decades of inconsistent activity, Bryan Jews finally began to establish lasting Jewish institutions in 1912. That year, Sam Levy led the way in forming a local B’nai B’rith Lodge, which also attracted members from nearby towns like Navasota and Hearne. The lodge was later named for Harry Marwill, a local Jewish merchant who died in 1918. 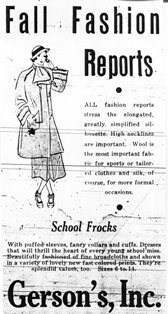 Also in 1912, J.W. English, a local Gentile, donated land to the trustees of “the Jewish congregation of Bryan,” with the deed stipulating that the land be used for a house of worship. Joe Gelber, Julius Levy, and Joe Groginski were listed as trustees of the congregation. In August of 1912, the group placed an ad in the local newspaper calling for construction bids on a Jewish house of worship. A few months later, they filed incorporation documents with the state as “Temple Freda Reform Congregation.” The congregation was named after Benjamin Kaczer’s wife, who had recently died. Kaczer, who owned a dry goods and grocery store in Bryan, was one of the founders of the congregation, though he left the city in 1918. The construction of Temple Freda proceeded quickly. Local Gentiles donated money and building supplies. In February of 1913, they held a cornerstone laying ceremony featuring Rabbi Maurice Faber from Tyler and various local dignitaries. Rabbi Faber had been instrumental in convincing Bryan Jews to organize and build a house of worship. The small, classical revival building was completed and dedicated in May, 1913. Three prominent Reform rabbis, Henry Barnstein from Houston, Maurice Faber from Tyler, and Henry Cohen of Galveston, spoke at the event. Local ministers also took part in the ceremony, which attracted a large audience of both Jews and Gentiles. Following the old adage that beggars can’t be choosers, the land on which the temple was built was not exactly prime real estate. Located right next to railroad tracks, services would often be interrupted by the low rumble and piercing whistle of trains. Members of Temple Freda would usually pause the service until the train passed. 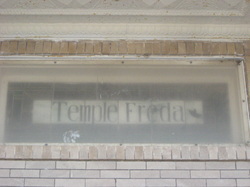 Even with its new building, Temple Freda remained a small congregation. By 1919, it only had 18 members and $300 in annual income. Its religious school had 14 students. The congregation held weekly services on Friday nights. Although Temple Freda never had a full-time rabbi, they would bring in visiting rabbis periodically. Rabbi Henry Cohen of Galveston lectured at Temple Freda in 1914 and led the congregation’s confirmation ceremony two years later. Rabbis William Greenburg of Dallas’s Temple Emanu-El and Henry Barnstein of Houston’s Congregation Beth Israel both spoke at Temple Freda in 1917. The congregation, which had 35 members by 1928, was always Reform in practice, but never joined the Union of American Hebrew Congregations. Bryan Jews also had a short-lived Jewish cultural society that brought in such guest speakers at Dr. H.J. Ettlinger of the University of Texas. Although Bryan remained a small Jewish community, new immigrants from Eastern Europe did settle in the city in the early 20th century. In 1911, Joe Kaplan left Russia and settled in Bryan, where he initially worked as a house painter and wallpaper hanger. After saving money for a few years, Kaplan was able to bring over his wife and three children, who arrived in Galveston from Russia in 1914. Joe’s brother Jake Kaplan also came to Bryan from Russia in 1914, working with his brother as a house painter. In 1917, Jake was able to send for his wife and two children who were still in Russia. According to the local newspaper, it cost Kaplan $1,155 to bring over the rest of his family. Such “chain migration” was typical for Eastern European Jewish immigrants who settled in America. In 1922, Joe Kaplan opened a store with Max Gelber, selling a unique variety of goods, including jewelry, art supplies, paint, and wallpaper. Adjacent to Bryan lies College Station, the home of Texas A&M University. The Jewish presence at the college dates back to its founding in 1876 when Meyer Cohen enrolled in its first class. During the school’s early years, a handful of Jewish students attended A&M. Perhaps the most prominent Jew associated with the university in its early years was Jacob Taubenhaus, a professor of plant biology. Taubenhaus was the chief of the plant pathology division of the Texas Agricultural Experiment Station. A national expert on plant pathology, Taubenhaus helped eradicate cotton root rot in Texas. Taubenhaus was named to a Hebrew University advisory board, helping to design the Jerusalem school’s agriculture program. In 1935, Taubenhaus was included in the Biographical Encyclopedia of American Jews. When Taubenhaus arrived at Texas A&M in 1916, he was the only Jew on the school’s faculty. He and his wife Esther were dedicated to fostering Jewish life on campus. That first year, they founded a Menorah Club for Jewish students. The couple held services and cultural programs for Jewish A&M students at their home. In 1920, the group became known as Hillel, the first Jewish college student group to have that name. When the national Hillel organization was established in 1923, they tried to get the A&M group to change its name. Once they realized that they had same goal of supporting college Jewish life, A&M’s Hillel became a chapter in the national organization. Esther Taubenhaus ran the A&M Hillel chapter for decades, until 1957. After years of meeting in campus buildings, the Hillel dedicated its own facility in 1958. Houston lawyer Billy Goldberg led the statewide fundraising effort to construct a campus Hillel building. 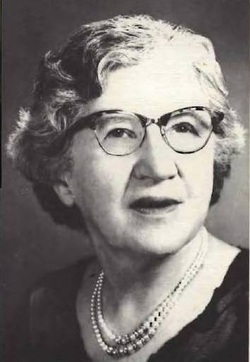 Shirley Reiser replaced Esther Taubenhaus as Hillel director in 1957, remaining in the position until 1979. In 1983, Rabbi Peter Tarlow began to lead Hillel. In 2011, Texas A&M Hillel built a new modern facility, and in 2013 Rabbi Matt Rosenberg became the rabbi and executive director. Multimedia: Miriam Feigenbaum's husband, Manuel, was born and raised in Czechoslovakia. After escaping Europe in 1939, he lived first in La Grange, Texas, and then spent time in Houston, where he began dating Miriam. Before proposing, he established a clothing store, Manuel's, in Caldwell, Texas, not far from Bryan-College Station. While the couple initially traveled to Houston for major Jewish holidays, they are an example of Jews in nearby small towns who have participated in the Jewish life of Bryan-College Station. While Hillel thrived in neighboring College Station, Temple Freda in Bryan struggled to remain active in the 1930s. Jacob Taubenhaus usually led services while Sol Gerson read the Torah. The two led Rosh Hashanah services in 1933. Later in the decade, Temple Freda suspended its regular services as its membership dwindled. Temple Freda enjoyed a last burst of activity after World War II when Sol and Felice Klein and Bettye and Frank Kahan moved to Bryan and revitalized the congregation. Sol and Frank would lead services and officiate at lifecycle events. Women in the congregation founded a Jewish Women’s Club in 1951. After the A&M Hillel dedicated its building in 1958, most area Jews began to attend services there instead of Temple Freda. By the 1960s, the temple was no longer used regularly. Most of the old Jewish families in Bryan were gone by then, while most of the newcomers were affiliated with the university. Later, Temple Freda was rented to various Christian churches. In 1983, it was named to the National Register of Historic Places. Today, it stands empty and endangered. In the 1960s, Texas A&M entered into a tremendous period of growth, initiated by its decision to accept female students in 1964. Between 1963 and 1998, the university grew from 14,000 to 45,000 students. Its faculty and administration grew as well. This explosive growth transformed Bryan and College Station. Bryan’s population increased from 18,000 people in 1950 to over 65,000 by 2000. The growth of Texas A&M has drawn a number of Jewish professionals to the area as faculty, staff, and administrators. These newcomers had no ties to Temple Freda and little interest in reviving it. In 1968, they established Congregation Beth Shalom, meeting in the A&M Hillel building initially. Sol Klein was the congregation’s first president. In the 1980s, the congregation had a falling out with Hillel over money, and began to hold services at the Unitarian Church and the Community Center. In 1990, Beth Shalom moved into its own building in Bryan. he congregation has always been Reform, affiliating with the Union of American Hebrew Congregations by 1970. Beth Shalom has never been very large and its membership is stable though not growing significantly. It had 55 contributing members in 1985, and 58 in 2010. Beth Shalom has never had a full-time rabbi, relying on lay leaders, visiting rabbis, and rabbinic students from Hebrew Union College. In 2010, Rabbi Barry Diamond of Dallas traveled to College Station once or twice a month to lead services. Texas A&M’s Hillel remains another center of Jewish life in the area. Those preferring a more traditional service to the Reform of Beth Shalom attend Hillel services, led by Rabbi Tarlow. Since 2007, Orthodox Jews have been served by a Chabad House. About 1,500 Jewish students attended Texas A&M in 2011. Added together with the school’s Jewish faculty and staff, university-affiliated Jews now dominate the Bryan/College Station Jewish community. Jewish professors have long since replaced Jewish merchants in the area. Jews also continue to play active roles in the larger community. In 2010, College Station elected its first Jewish mayor, Nancy Berry. While the Jewish community may never experience significant growth, the continued vibrancy of Texas A&M will ensure that it remains strong and active.